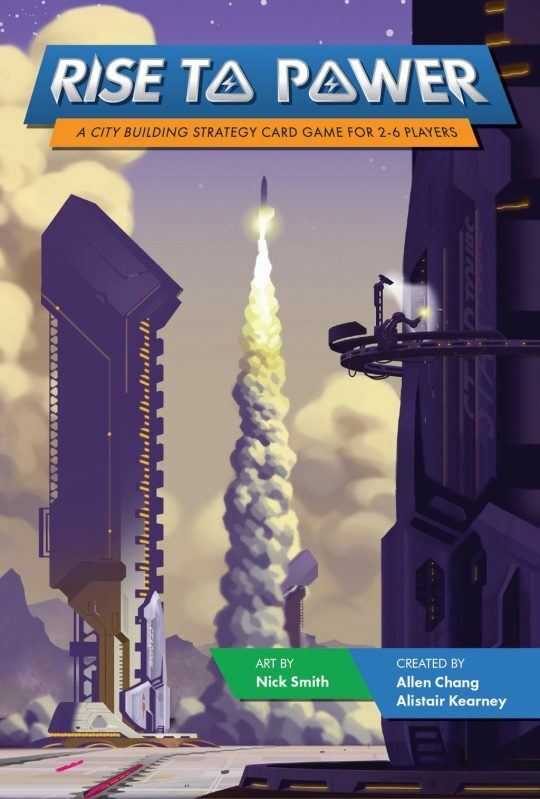 Rise to Power is a city-building strategy card game for 2-6 players, set in a futuristic world where companies compete to fulfill the world’s power needs. The game is set in a futuristic world that has discovered an abundant source of energy, dubbed PRISM. Competing power companies are scrambling to extract as much PRISM as they can to increase their influence by powering districts and ultimately controlling the city’s power needs. Activating a district card allow players to expand their power grid capabilities and also increases a company’s influence. Instead of activating a district, a player could instead use the card’s exchange ability to perform a powerful action at the cost of giving up the district, placed on the The Exchange for others to take. Players take turn extracting PRISMs, and using it to fulfill district contracts offered by the government. As players power districts, their play area will reflect the state of their city influence. When powering districts, players are rewarded for paying the exact amount, portraying efficiency and promoting careful planning. When a player activates their 8th district, the game enters the last round phase. At the end of the game, players with the highest influence points, earned by activated districts and their private agenda is declared the winner.